This is one of my very best recipes. These breadsticks can be made from scratch in about 40 minutes, from start to finish. They are light and delicious with any kind of Italian dish, or with soup. This recipe makes one cookie sheet, or about 36 small 2×5 inch breadsticks. It works great in a Kitchen Aid. If you are going to use a Bosch you’ll need to double the recipe. 1. Mix the water, sugar and yeast together in a measuring cup or in the bottom of your mixer. Let it sit for 5 minutes. 2. Add the salt and the flour, one cup at a time, until it is well incorporated. Mix on high for 5 minutes. Let the dough rest for 5 minutes. 3. Melt the butter and pour half of it into a jelly roll pan (large cookie sheet). 4. Place the dough in the center of the pan. Let it sit for 2 or 3 minutes. Letting the dough rest makes it MUCH easier to shape. 5. Spread the dough out flat onto the pan until it reaches all of the edges. 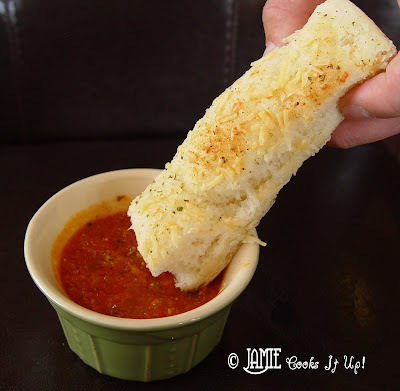 Doing all of the spreading and cutting of these bread sticks, in the pan makes cleaning up your counter so much easier! 6. Pour the other half of the butter onto the dough. Spread it around with your hands. Sprinkle the Johnny’s Garlic Seasoning all over the dough, and then the Parmesan cheese. 7. With a pizza cutter cut the dough into three rows lengthwise, and then into about 12 little height wise rows. 8. Put the pan into a 170 degree oven for about 7-10 minutes. The breadsticks should rise about 1 inch. 9. Turn you oven up to 350 and bake for about 12 minutes, or until golden brown. 10. When they come out of the oven let them sit and rest again for about 5 minutes. Then redefine your cutting lines with the pizza cutter. 11. I use a pair of cooking scissors to cut the edges where the pizza cutter can’t reach. Fabulous Red Pizza Sauce. You can put it together in a jiffy. That’s it! They are wonderful. I have played around with a variety of things that can be put on the top. I will post those recipes in the days to come! Johnny’s Garlic Spread seasoning is one in a million. I buy it at Costco, and keep several in my long term food storage. It’s really great to have on hand. ENJOY! 6. Pour the other half of the butter onto the dough. Spread it around with your hands. Sprinkle the Johnny's Garlic Seasoning all over the dough, and then the Parmesan cheese. 11. I use a pair of cooking scissors to cut the edges where the pizza cutter can't reach. That's it! They are wonderful. I have played around with a variety of things that can be put on the top. I will post those recipes in the days to come! Johnny's Garlic Spread seasoning is one in a million. I buy it at Costco, and keep several in my long term food storage. It's really great to have on hand. ENJOY! These are wonderful. Everything you make is. I'll have to try these breadsticks! I made some the other day, but they weren't as soft as I would have liked them to be…these look like they would melt in your mouth!! I love your site, your recipes, your pictures. Your children are adorable. I, too, love butter not margarine. I have some health issues, but LOVE cookies, etc., so I am one person who is grateful to use pureed beans in recipes so I can indulge my sweet tooth. You are so lucky to be able to put real butter in your recipes. Rachelle @ "Mommy? I'm Hungry!" I just discovered your website last week when looking for a recipe for breadsticks. (They were delicious by the way!) I have recently started baking all my own bread, muffins, snacks, etc. I noticed how many of your recipes call for large amounts of flour to make many loaves of bread. I feel like baking would be easier if it took me less time to measure out all the flour! What do you use to store your flour? I use a glass canister for sugar, but couldn't find one large enough for flour, so I'm just scooping out of the bag it comes in and making a huge mess of my kitchen in the process! Your advice? Thanks!! I do find myself in a mess of flour quite regularly! I keep my flour in a large canister inside a really deep drawer. I keep all of my basic baking supplies in the same drawer. I do have to refill the flour container pretty regularly, as it only holds about 15 cups. It seems I am always refilling it, however it does make less mess than scooping the flour out of the large sack. Hope this helps! I'm glad you liked the breadsticks. They get made a lot around here, I can tell you that. Love these! Great for Italian night! You had me at bread sticks in 40 minutes. What a wonderful treat. 40 minutes? How can I not give these a try? Can these be frozen/reheated? Otherwise we'd probably eat the whole batch in one sitting. They look wonderful! They are not as good the second day, however I still reheat them a bit in the microwave and give them to my kids for lunch. Haven't heard any complaints. However, they are to die for hot out of the oven. We usually send some around to neighbors. Good luck! Let me know how they turn out! Do you use any specific type of yeast? I find that I have trouble with rising dough, it never seems to! Also, do you have any advice for making these without a kitchen aid? You could use Active Dry Yeast or Instant Yeast. You'll want to be sure that the temperature of your water really is warm. Also, putting the pan of breadsticks in a warm oven to rise helps a lot as well. If you are going to make these by hand, you'll need to knead them on your counter for at least 5 minutes, then lest the dough rest for about 15 minutes, knead again for just a minute or so and then you should be ready to get them in the pan. Good Luck! Only 40 minutes?? Love it! I made these a couple days ago & they were a HUGE hit!! I can't believe how easy they were. I love your blog! I also made you chicken noodle soup, so yummy. I would like to post them on my blog and link back to you! Thanks so much for sharing all your great recipes! Let me know when you post them and I'll come and have a look! I am new to your blog and made these today and they turned out wonderful! Thank you so much! Keep those recipes coming! When you say jelly roll pan do mean just a cookie sheet and not actually a true 10 1/2 x 15 1/2 inch jelly roll pan? I made the sugar cookie bars in a ture jelly roll pan and had to cook them an extra 10 minutes becase they were so thick. I want to try these but just was wondering what the pan size was. Thanks for your help!! Stephanie, I do use a large cookie sheet. Sorry for the confusion. Hope they turn out better next time! Have a great day! I have frozen these before and reheated them. The best way to do it is to let them thaw out either on counter top or fridge. Then to reheat them, wrap only what you will eat in a dish towel (flour sack towels work best)and microwave. Make sure you don't over cook them, they warm fast. Sometimes it helps to lightly moisten the towl. Then they are still tender and yummy. Just keep them wraped in the town until you eat them. These were so easy to make. I think next time I will try them with mozzarella. Delicious! I am hoping I am doing these right. I dont have a kitchen Aid so I am following what you said to another poster, but I dont know if you supposed to put them in the oven at 170 first or just bake them. Can you let me know please? After the dough has been spread in the pan, sprinkled with toppings and cut, you place it in the oven at 170 degrees to let it rise faster than in would on your counter. The warm heat helps this. Then when they have risen up a bit (about 2 inches in height) turn your oven up to 350 degrees and bake. Leave the pan in the oven while it increases in temperature. I store my flour in old ice cream buckets. A bag of flour usually fits nicely. Super easy to pull out and measure!! Jamie you're blog is the best! These breadsticks are SO good. My mom (Pam Corry) also makes a sweet version of these by sprinkling cinnamon, sugar, and nuts on them instead of the savory seasonings. After they come out of the oven she drizzles them with a glaze/icing. They are great for breakfast! Jamie i love your blog and am so glad to see in the comments that im not the only one that doesnt have a stand mixer. Thank you so much for putting in how long to kneed for if its by hand. One day i will own one but tell then i will be getting the best arm workout ever. Would you be willing to add in the comments how long to kneed if we dont have a stand mixer on some of your other amazing bread recipies? I was wondering where you find the garlic seasoning? They are delicious! Your recipes are amazing. We own a Wall Mirrors ecommerce site and are always looking for great content to share and help inspire. Thanks. Never makes bread before, would like to try your breadsticks. You're asking 31/2-4 Cups of flour. Do I measure 31/2 or 4 cups of flour & do I use unbleached all purpose flour & bread flour? . Good luck with your breadsticks! This is a great recipe for a beginner. Start with 3 1/2 C flour, then add a bit more until the dough is the right texture. You'll know it is right when the dough scrapes the side of the bowl clean, or if you press your finger into the dough and it spring back a bit. I always use all purpose flour, but bread flour would work as well. Good Luck! Hope you love them! Question…since I am clueless about bread in my Kitchen Aid…do you use the bread hook or the paddle or the whisk for mixing for the 5 minutes? As I said, I am clueless, but these look amazing. Love your site! You need to use the bread dough hook. Good luck! I hope you love them! Jamie- I just wanted you to know I love your bread! I make it a ton know and have posted a link from my blog. I have had many a comment about your site and recipe. I just wanted you to know people love it. Made these last night…YUM! They smelled heavenly and tasted oh so good! I think I ate about 6 of them myself. The best part though is that they're so easy! I couldn't find Johnny's Garlic Bread Seasoning around here so I used the garlic bread seasoning recipe from Our Best Bites. This really incredible! Love the complete demo of the it. It's really a great bite. Hi I've been looking for the garlic seasoning in my local stores, and can't seem to find it. do you know where I can find it? I have always purchased mine at Costco. Hope you have luck finding it there! It's so easy to prepare. I love everything about it. The cheese and everything plus the dips. Love LOVE LOVE the breadsticks. They are the best I have ever made and my husband said it was a keeper!!!! Thanks for your recipes. I love your blog. I have tried 2 recipes so far and going to try more. My friend told me about your site and she brought me by some food she made from your site. THANK YOU THANK YOU for making my life easier and tastier. Thank you for this recipe. I was in a bread bind and needed a quick bread or breadstick to go with dinner for a neighbor. These were perfect!!! Yum! Hi, I am not familiar with the Johnny's Garlic Seasoning, are there any substitutions? Just found your blog today, and am so excited!!! So far everything I have seen I want to try. The only place I can find Johnny's Garlic Seasoning is at Costco, however I've heard some Costco's don't carry it depending on what state you live in. If you google it, however you can buy it online. Good luck! Wish I knew of a perfect substitute. Thank you Jamie, we don't have a Costco so I will go on line and order. May try to use just garlic salt until I can get it. Thanks so much for answering me!